In 1957, Eugene Smith walked out of his comfortable settled world—his longtime well-paying job at Life and the home he shared with his wife and children—to move into a dilapidated, five-story loft building in New York City’s wholesale flower district. 821 Sixth Avenue was a late-night haunt of musicians, including some of the biggest names in jazz—Charles Mingus, Zoot Sims, Bill Evans, and Thelonious Monk among them—and countless fascinating, underground characters. From 1957 to 1965, Smith exposed 1,447 rolls of film at his loft, making roughly 40,000 pictures, the largest body of work in his career, photographing the nocturnal jazz scene as well as life on the streets of the flower district, as seen from his fourth-floor window. He wired the building and made 1,740 reels (4,000 hours) of stereo and mono audiotapes, capturing more than 300 musicians. 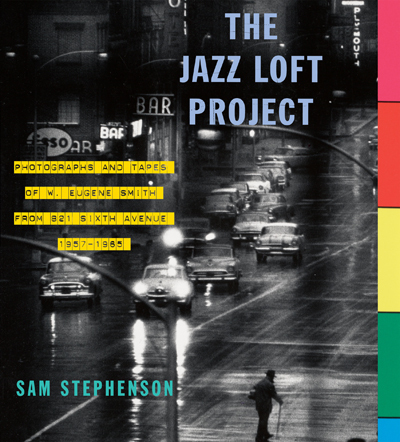 W. Eugene Smith’s Jazz Loft Project has been legendary in the worlds of art, photography, and music for more than forty years, but until the publication of The Jazz Loft Project, no one had seen Smith’s extraordinary photographs or read any of the firsthand accounts of those who were there and lived to tell the tale(s).